Hi all, Yogi here with two cards using the same stamps and technique - you decide which you like better. BIG GRIN. They are both very quick and easy to make and I'll be running off a bunch for my Xmas stash this year... Have you started yours yet?? 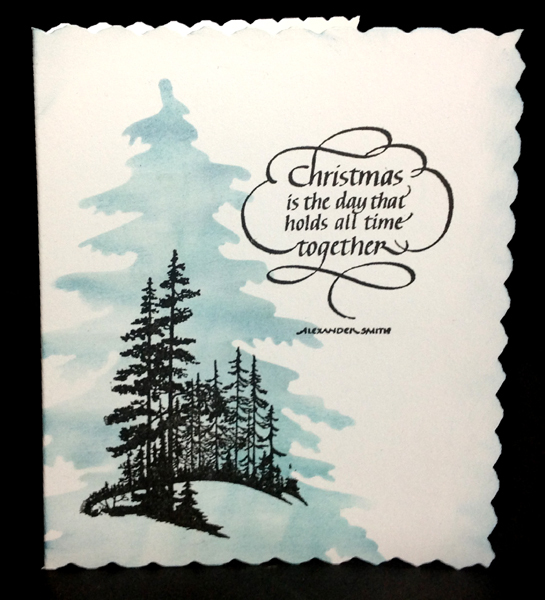 I side folded the white card - 4.25"w x 5.5"h.
Die cut the Xmas tree (Marianne Designs CR1224) from cardstock to use as a stencil. Its a really big tree - 6" tall. Sponged Distress Broken China in linear streaks going from a solid area into the opening. Note: the normal circular motion that I use would ruin the stencil, hence the linear streaks. Keeping the stencil in place, stamped the pine tree scene (Cornish Heritage Farms "The Pines") using Versafine Black Onyx. 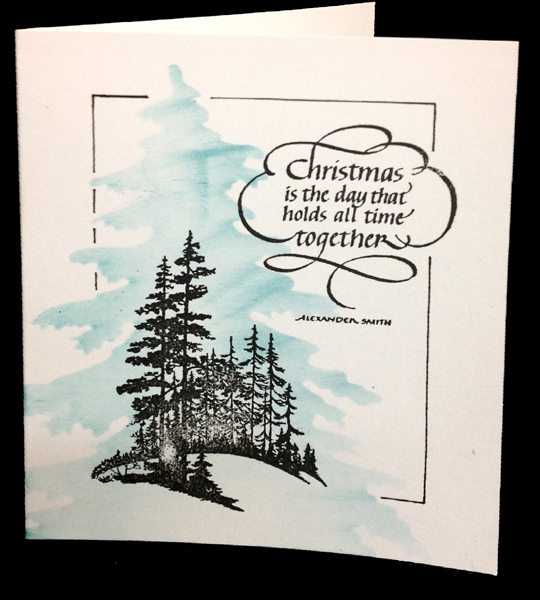 Stamped the quote (Quietfire Design) Using the black. Hope you give it a try. Any large die should work coupled with a small scene type stamp or a larger scenic stamp and selectively choose an area on it. These are gorgeous Yogi, and I do agree with you I like the one with the Zig writer border the best too. it frames the tree and scene much better, to my eyes. Love this idea! And I love the border too--makes such a polished image. I'm such a follower! I like the hand drawn border too! Wow! These cards are fabulous. If I had to pick, the one with the border gets my vote. But both knock my socks off. Yogi, this is a very cool idea!!! 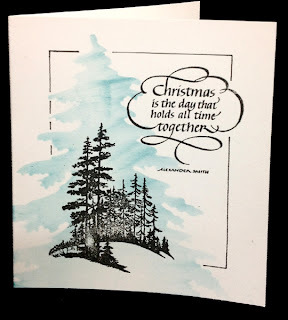 I love the stencils large tree behind the stamping!!! VERY COOL!!!!!!!!!!!!!! O.K. I must follow suit. I also prefer the 2nd one. The border really gives it a polished look. Beautiful cards. Thanks for the lesson. Love both Yogi but I agree, my favourite is the one with the border. Very nice. I like the one with the border it really add something to the card.